Visit our dedicated fabric web store Baize and Wool Fabrics to see our extensive range of woollen fabrics. Buy green baize remnants for your sewing or craft project, available in assorted sizes. Made from 95% British wool and 5% nylon, our remnants are genuine baize that is durable and hardwearing, and is the very best surface for cardplay. Baize is also used extensively by professional furniture restorers and upholsterers for all sorts of projects including drawer lining, lining wooden boxes and trays, covering instrument cases, recovering antique card tables, backing coasters and ornaments, covering church doors etc. This thick, durable woollen fabric is also suitable for sewing projects such as cushions, placemats, coasters, aprons etc. Our offcuts are available in assorted sizes, so you can pick the piece that’s just right for your needs. We cannot guarantee that all offcuts of the same colour are from the same die-batch, so there may be some variation in colour and thickness if you buy multiple pieces. Other sizes and colours are available – if you’re looking for something specific, please contact us with your requirements. We at Simon Lucas Bridge Supplies have been making top-quality baize table cloths for bridge for over quarter of a century, so we consider ourselves to be experts on fabrics for card tables and cardplay. There is a lot of confusion about the difference between baize and felt. 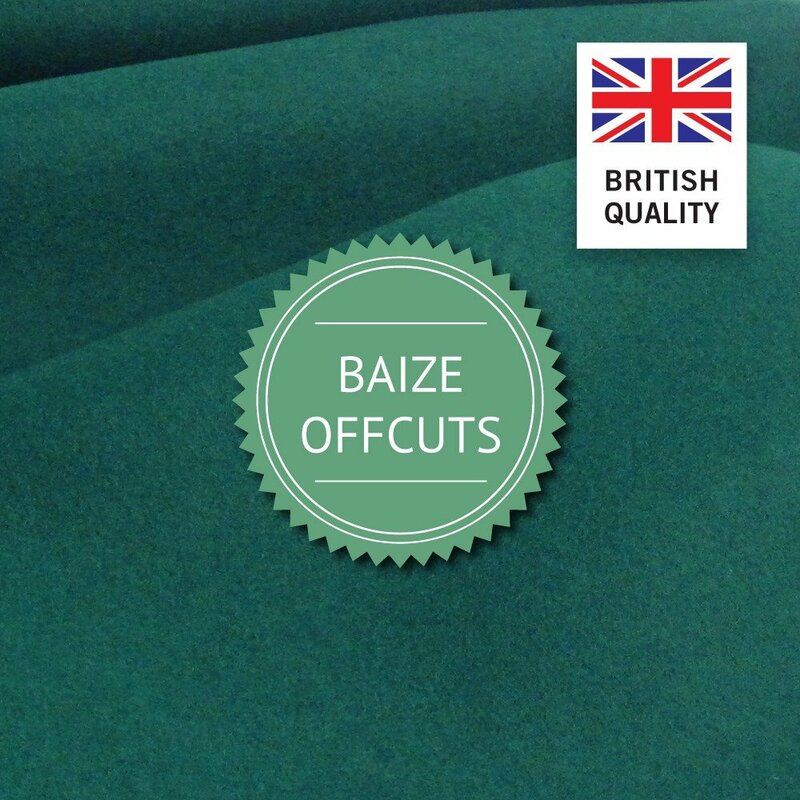 This isn’t surprising when you search online and find many suppliers describing felt as baize, or a fabric as ‘baize felt’, ‘felt baize’ or even felt/baize as if the two fabrics are the same. They’re not! It’s important to know whether you’re buying baize or felt, because the two fabrics are very different. Felt is a lightweight fabric made from matted fibres of either wool or a synthetic. Being matted rather than held together in a tight weave, the fibres easily fluff up or ‘pill’ if rubbed. On the other hand, baize is a strong, dense and hard-wearing fabric made from woven strands of wool. It it’s top-quality, such as the fabric we’re selling here which we also use to make our baize bridge cloths, it doesn’t pill and it will look great and last for many years. There really is no comparison between felt and the far superior baize. You can purchase baize from us with complete assurance that you are buying a top-quality fabric. Click Here to read our full guide to Baize and Felt.